Do you have any fun summer plans with your family and/or friends? One of the essential things when heading out on a trip, especially if it’s a long trip, is snacks! I don’t know why, but road trip snacks always seem more fun and exciting than when you have them in a normal day. For some reason that bag of chips or package of Twizzlers Twists taste even better when you’re on the road. Today I have a fun recipe with a little twist on a classic recipe that you can share with family and friends this summer, with all puns intended! 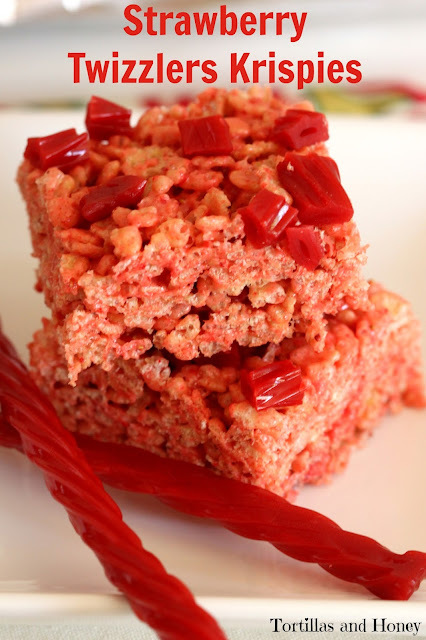 When thinking of a new recipe, I decided to pick up some Twizzler Twists at Walmart and use them to infuse these krispie treats as well as a strawberry powder to really make these treats have some extra strawberry taste! My hope is that these krispies make a fun recipe just a little more fun! One of the great things about all flavors of Twizzlers, which make them an ideal summer snack, is that they don’t melt. So if you’re family is going on a road trip, Twizzlers are great to take with you for you and your family and friends to snack on. These snacks are also great to take with you on vacation because you can make them ahead of time and wrap them up in little individual packages. Then you can pull these out whenever you want a little snack to get you through a day or through a long road trip! For more fun summer ideas that feature Twizzlers, please go to the Twizzlers Summer website! What fun snacks do you like to bring with you on road trips? Place the Twizzlers and cereal in a large mixing bowl, and toss together to combine. Grease a 13x9-inch baking pan and set aside. In a food processor, add in the freeze-dried strawberries, then pulse into a powder. Set aside. In a large saucepan, melt the butter over medium-low heat. Add in the marshmallows and stir until melted. When marshmallows are nearly melted, add in the strawberry powder, then continue stirring until fully combined and the marshmallows are completely melted. Add the marshmallow mixture to the cereal mixture and stir until fully combined. Then pour the mixture into the prepared pan, and press down firmly until even. Garnish with diced Twizzlers, making sure to press down so that it adheres to the krispies. You totally rocked this challenge! I signed up but sadly was not chosen. I need these tho.